Wonder leads the academic experience at The Walker School. 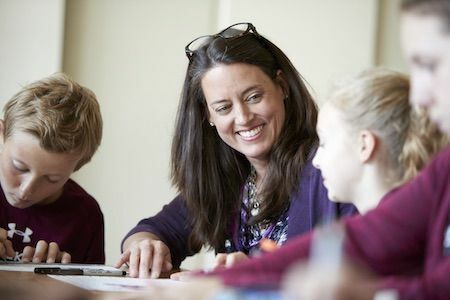 From Primary School to Upper School, teachers take an inquiry-based approach to learning. Emphasis is placed on a traditional college preparatory curriculum with the freedom to pursue topics inspired by current events or that have piqued the interests of students. Our students learn by doing, by teaching others, and by exploring their passions. Such a nimble approach enables students to develop scholarly habits, as well as soft skills that will serve them throughout their lives. We provide an atmosphere conducive to learning in a stimulating yet nurturing environment. Equipped with a healthy curiosity, a supportive network, and an appreciation of the world around them, Walker students learn to make choices, becoming more discerning individuals, shaping their distinct perspectives, and achieving a mastery of subject matter and self. Our expectations are high but the pressure is low, thanks to the small teacher-to-student ratio that allows for more personal attention and close relationships that instill in the children a sense of responsibility to their teachers, their peers, and themselves.